“A week after the cyclone we’re starting to grasp the scope and complexity of the challenges facing the governments and peoples of these three nations,” said Mohammed Abdiker, Director of IOM’s Department of Operations and Emergencies. IOM and its international partners are working on the details of a broad appeal that will be issued in coming days to assist those affected by the emergency across the three nations. Conditions are challenging everywhere, after the cyclone made landfall on March 15; thousands are stranded in tropical zones without bridges or accessible roads. Mozambique’s official death toll from Cyclone Idai’s landfall has reportedly risen to at least 242 persons, but that number is expected to increase in the days ahead. The government expects the toll of fatalities to surpass one thousand, with 142 confirmed injured, and an untold number still missing. Mozambique’s government estimates that some 400,000 are internally displaced at this time and has declared a state of emergency. Shelter materials from the U.K.’s Department for International Development (DFID), including 7,550 shelter kits and 100 family tents sufficient for 38,000 people, arrived in Mozambique’s capital, Maputo, Tuesday. More emergency aid is due to arrive from Switzerland and Italy. “The situation is very bad. The damage is quite serious,” said IOM Mozambique Chief of Mission Katharina Schnoering. “There are many communications issues.” Difficulty restoring power to the large city of Beira and problems with road access, where the rising Buzi River has washed out sections of highway, also complicate aid delivery. In Zimbabwe, the cyclone reached the districts of Chimanimani, Chipinge, Masvingo and Mashonaland East, affecting over 50,000 people. More than 120 bodies had been washed into neighbouring Mozambique, where residents buried them. At least four bridges have been washed away. Total fatalities known to IOM are 259, with hundreds more injured. Some 217 are missing. Authorities confirmed that 16 000 households have been displaced (Chimanimani 8000, Chipinge 3000, Buhera 1000 and Mutare 4000). Among national and international partners responding to the crisis, the Government of Zimbabwe through the Department of Civil Protection (CPD) requested IOM be the lead agency on shelter and Non-Food Items (NFI) cluster. “We are swiftly responding to areas of Manicaland, Mashonaland East and Masvingo which are in desperate need of relief. Our UN migration partner IOM is coordinating the shelter and NFI emergence assistance response and they are already in Manicaland for rapid emergence needs assessment,” said Nathan Nkomo the Director for the Department of Civil Protection. The District Administrator for Chipinge, Wilson Mashava, appealed for more humanitarian support to reach out to more displaced households in desperate need of assistance. IOM Zimbabwe has dispatched 1,000 tarpaulins and 200 Non-Food Item kits as part of its initial response. Joint rapid needs’ assessments with partnering UN and government agencies began on Monday (18 March), covering the Chimanimani, Chipinge, Mutare, Nyanga and Buhera districts. 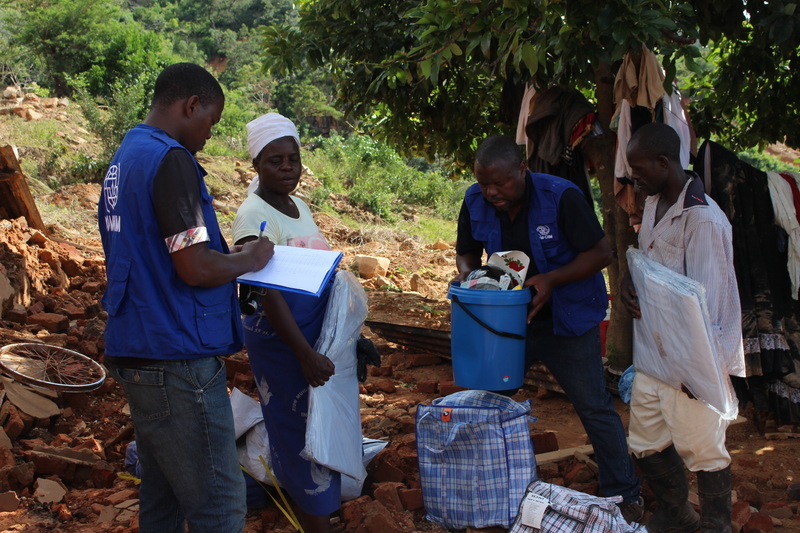 In Malawi, IOM is aware of 56 confirmed deaths, 577 injuries. Countrywide, the Government of Malawi estimates some 920,000 displaced persons. Mr. Nkomo thanked IOM Geneva for the release of USD 75,000 in emergency funds. The three IOM units in Malawi, Mozambique and Zimbabwe with the support of Regional Office Pretoria Emergency Unit and DOE Geneva HQ jointly working on a sub-regional appeal for more aid from the international humanitarian community.